These are a full set of five Seishin for Malifaux. They’re part of the Resurrectionists faction and thematically linked with Kirai Ankoku. I understand that in the brave new world of Malifaux’s third edition that themes are going to be rather important so I guess that they might never see the table now without Kirai. In the past they’ve provided tiny support abilities to friendly models, usually at the cost of Sacrificing the Seishin. Luckily they tend to be summoned incidentally all over the place anyway so their sacrifice was not a big deal. When I originally bought these, I had all sort of ideas for cool painting of these as various dragons and so on. Eventually they got put away in the case and forgotten about, and anyway as probably the cheapest models in the game they’re easy to justify overlooking. In the end I got a hankering to put some colour on the Seishin simply to clear them from my backlog and realised that, since they’re supposed to be some kind of ghosts, I could just paint them accordingly. Hence, they got the simplest of paint schemes: white, then a green wash, then more white over the top. Simples. I dedicate this post to Azazel‘s Gender-Ambiguous Model Painting Challenge for March. These are clearly not specifically male or female so I consider them a perfect fit. Since the miniatures themselves are not super-interesting (and anyway are all the same colour) I thought I’d share pictures of them on various different coloured backgrounds that came with my lightbox. I still prefer the white background though. Next on the painting table: Jarl Skuld, Devil of the Thornwood. After a bit of a break, I attended another of Kai’s Malifaux tournaments at Common Ground Games in Stirling. There has been a long period this year where I haven’t been very enthusiastic about Malifaux but lately I’ve been missing it and was very glad to have the opportunity to get back into the saddle. I borrowed some Horrors from Gareth so that I could test out how I fare with Forgotten Life on Molly with a plan to use a more-or-less fixed crew for all three rounds. I hadn’t actually tried the crew before so it would be a learning experience all the way. My first round opponent is Michael; funnily enough we’d been messaging each other on the way to Stirling and he had hoped to face me again to make up for forgetting how to play the strategy during our last match-up. So he got his wish in round one. With Ours as the Strategy, I intended to use the Kentauroi to fire Molly forward and gum up the Ten Thunders crew as far back as possible and force them to spend their AP dealing inefficiently with my summons. This should allow me to use the Guild Autopsies to stand just in my two quarters and either twiddle their thumbs while scoring (they’re only 4SS each, after all) or take shots of opportunity as needed. I took the other three big Horrors in the Valedictorian, Rogue Necromancy and Yin simply because they’re cool and I could possibly do some tricks with Molly’s (0) action. Also, Black Blood makes me happy… at least as long as it is on my models. Nothing in the scheme pool looked very promising so I took Dig Their Graves (I’m going to try to kill things anyway, and in a pinch I can summon Drowned to get the scheme markers out) and Guarded Treasure. The requirements for Guarded Treasure are needlessly restrictive, but my hope was to use the Autopsies to move around and drop scheme markers near enough to my heavy hitting pieces on the assumption that the line of engagement would be somewhere close enough to the centreline. Turn 1: The Snipers get started by putting some wounds into the Necrotic Machine and the Rogue Necromancy. Much of the turn is spent moving to position; Hungering Darkness uses Heed My Voice to make the Valedictorian walk directly back toward my board edge; so much for my threat ranges. Eventually the Kentauroi pulls Molly forward enough that she can summon a Punk Zombie, a Kentauroi and a Drowned right in the middle of the biggest group of Ten Thunders. Sadly this cost me enough cards that they don’t actually achieve anything of note when they arrive. Still, they should take a bit of time to put down. Turn 2: Hungering Darkness flails at Molly. She doesn’t take much damage after Masterful Dead and Soulstone use, but frustratingly I flip the Black Joker on her Horror duel from Consume Brilliance. Amusingly, this costs Michael enough cards that the nearby Illuminated also fails his Horror duel; still, I think that I’ve come out worse in the trade here. The Kentauroi charges into the Ten Thunder Brother but misses twice. Lynch comes forward and drops a four ace 52-Card Pick Up on Molly, she ends up on a single wound remaining. Ouch! That’s a good way to get round her defensive trigger, though I don’t think I had any cards left anyway by that point. Yin pushes in to engage the Ten Thunder Brother and gives him Gnawing Fear. The Drowned gets Lynch down to a single wound and then a Kentauroi charges an Illuminated, landing close enough to Lynch that the Black Blood will kill him. Meanwhile the Guild Autopsies position to be just inside my quarters and drop scheme markers for the Rogue Necromancy and the Valedictorian to rather sheepishly stand on top of. I score for Ours and Guarded Treasure and Michael declares Public Demonstration for the full three VPs. Turn 3: Molly summons a Drowned then kills Hungering Darkness herself, makes the Punk Zombie kill an Illuminated and chain activates the Kentauroi to drop the Wandering River Monk. These activations pretty much break the back of Michael’s crew and my attrition advantage is so big now that I’m pretty much certain to close out the game; of course, we still need to decide the margin. The Punk Zombie takes out the other Illuminated to score Dig Their Graves and a Drowned finally finishes the Ten Thunder Brother. I score for the strategy and Guarded Treasure and Michael announces Set Up on Yin to score two VP. Turn 4: The Drowned puts down a scheme marker and Yin kills the Sniper on the left for Dig Their Graves. I’m ready to call it here but Michael helpfully moves the other Sniper closer to me to get a shot off at Molly so I send all I have left toward him in case I can pick up the final point for Dig Their Graves. I score Guarded Treasure and Ours again. Turn 5: The Sniper flees into his own corner but the Kentauroi carries the Drowned toward him so he can drop a scheme marker. Molly finishes the Sniper off for the final points. Resurrectionists win 10 – 5 (full score for me; 3 for Public Demonstration and 2 for Set Up for Michael). That went pretty much according to plan. As ever it is a pleasure to play Michael and we both took our good cards and bad with smiles. I hadn’t understood quite how deep I could pin Michael’s crew so in the end the Valedictorian and Rogue Necromancy were pretty much reduced to standing around scoring for Guarded Treasure (the latter contributed a few long range shots with Acid Breath). On the other hand they did guarantee me seven VPs for Guarded Treasure and Ours, so perhaps I shouldn’t overlook their contribution. For this round I had originally intended to stick with Molly but I got paired up with Ross. We played a very similar game in the Scottish GT and he beat my Spirit Molly crew with some clever Zipp plays. Over lunch I decided that it was likely that Ross would play Zipp again, and that it might be more effective to mix things up a little. So I took a Reva crew which is probably a better fit for Public Executions anyway (long ranged damage versus summoning in disposable minions seems like the better strategy to score points and deny them). The combination of Reva herself, Maniacal Laugh, Anna and the Emissary should ensure that there are good number of Mindless Zombies in play (not to mention Corpse Candles) so I decided to take Asura so that they would have something useful to do. Asura is a pretty good pick for Undercover Entourage since she’s a low priority target who can easily spare some AP to move in the late game. I picked Search The Ruins as my other scheme mainly because my general ‘kill them all and ask if anyone has any questions later’ approach fits in well with a scheme that I can score in turn 5 and partly because I didn’t expect the Gremlins to contest the centre unless Ross took the same scheme (and in that case, I would aim to kill everything, then drop scheme markers). Turn 1: The Student makes Zipp Fast and the Doxy pushes Reva forward. After a few timewasting activations on both sides (Bayou Gremlins doing nothing much, most of my crew moving forward) Zipp goes in for Reva. I’m hoping that the combination of Ht 3 for Reva and the presence of Anna’s auras will mitigate the damage here but Ross helpfully top decks 13s for Zipp’s first two attacks and sends Reva way back from my intended angle of attack. He then turns into a Bayou Gremlin. Reva summons a Corpse Candle and places next to it. She charges the Lightning Bug and kills the Iron Skeeter (this also ensures that the Bug will die to Burning at the end of the turn). Burt stabs Reva and Raphael takes a pot shot at Reva but misses. Turn 2: Burt swings at Reva and flips the Red Joker on damage; Ross announces Eliminate The Leadership. Reva kills him in return and charges away from the action to kill off a Bayou Gremlin on the left. Despite this distance, Zipp’s mobility allows him to get over to Reva and throw her back toward the rest of the Gremlin crew before turning into a Bayou Gremlin again. The Emissary kills this new Gremlin and then a random Bayou Gremlin kills off Reva to wrap up the points for Eliminate The Leadership. I’m out of cards so my attempt to get the Doxy to Take The Lead with Anna into range to contribute doesn’t work; she’s obliged to walk up. A Shieldbearer puts down another Bayou Gremlin but she’s out of sight of any other Gremlins so we draw on the strategy. Turn 3: For the third time, the Student of Conflict makes Zipp Fast. The Carrion Emissary hurts Raphael but I Black Joker the damage flip that would have killed the Gremlin. Asura puts Grasping Hands on the Student but even so the nearby Mindless Zombie can’t land a hit. Raphael hurts the Carrion Emissary and then the Dead Doxy succeeds and pushes Anna Lovelace close enough to the Bayou Gremlin at the top of the board to kill the little chap. I score for Public Executions. Turn 4: Zipp looks at the board state and decides to triple walk to hide in my deployment zone. The Carrion Emissary finally gets Raphael and I move Asura into Ross’s deployment zone. My Shieldbearers finish laying scheme markers round the centre of the board. It’s clear that we’re not going to be doing anything in turn 5 so we call it there. Resurrectionists win 8 – 6 (2 for Public Executions, 3 for Search The Ruins and 3 for Undercover Entourage for me; 3 for Eliminate The Leadership and 3 for Undercover Entourage for Ross). I love to play Malifaux with Ross. His style of cagey hit and run attacks is very much in contrast to my ‘go for the throat’ approach and his positional play with Zipp in particular is really good. This game was very tight and could have gone either way. Burt’s Red Joker against Reva on turn 2 made quite a big difference as it really affected how I played Reva that turn; I had to be a bit more careful and hope to survive by distance (though of course, it didn’t help) rather than taking the initiative and making Ross react to my plays. I was quite glad that my choice of schemes paid off as this has been one area of my game that I feel has especially suffered from lack of practice. Asura as Undercover Entourage target is quite risky as she hasn’t really got any defenses apart from being surrounded by more important targets. I was quite close to taking Eliminate The Leadership instead and was glad I didn’t since Zipp is so hard to make damage stick on. With Interference as the Strategy, this is really Molly’s area of expertise so it’s a really easy choice to go back to plan A and use the Horror Molly crew again. In particular, with close deployment I can unleash Molly in a single activation if there is an inviting cluster of models to summon from (though I don’t expect Jamie to give me anything so easy as he’s quite experienced). Looking at Jamie’s crew I decide that Punish The Weak is a good option as I’ll want to deal with the three Minions anyway and even if I don’t get them with Molly or the Valedictorian I can probably do it before the end of turn 3 to wrap up all the points. My crew will give up Punish The Weak quite easily but that’s just something I have to accept and play round. Covert Breakthrough is quite easy to score in close deployment and, like Search The Ruins from round 2, can be scored entirely in turn 5 when I have hopefully killed off all the other models. I did consider putting Unnerving Aura on the Valedictorian and/or Yin to pick up Show of Force instead but it doesn’t really work well with Interference and I’m happy enough with my two chosen schemes. Turn 1: Mah pushes up, walks and swings ineffectively at Yin before going disguised. The Necrotic Machine pokes her back for just as little impact before Trixibelle pulls Mah back to relative safety. The Kentauroi moves up and pulls Molly forward and she summons two new Kentauroi in places where Black Blood will be most annoying. The Taxidermist hurts one of them and drops a corpse marker; it immediately eats the marker to undo the Taxidermists work and pokes Mah gently. Yin charges Francois and puts Gnawing Fear on him; he obligingly fails his Horror duel to attack back. The Slop Hauler is rather braver and knocks a good chunk of Yin’s wounds off despite Mass of Viscera; Black Blood is not kind to the little Gremlin though. The last Kentauroi gets the Rear Up trigger off Rotting Hooves and kills both the Slop Hauler and the Survivor on the left. Meanwhile, the rest of our crews slowly converge on this scrum with the exception of the right side Guild Autopsy who is content to find a spot where he can claim my quarter and not get killed too easily. Turn 2: Trixibelle cheats the initiative flip. Mah charges in and kills Yin (I have to say I don’t think that I’ve ever lost Yin so easily) and chain activates Francois who kills one of my summoned Kentauroi. Molly kills Francois in return and summons a fresh Kentauroi, thus restoring the natural order of the universe. Sammy Jinxes the Rogue Necromancy to stop it from moving and Molly to make her scary for friendlies. The Rogue Necromancy reminds Sammy that it is not only a melee beatstick by showering her in Acid Breath and killing the Taxidermist with the blasts. Trixibelle pushes a Kentauroi around and Slows it. The Valedictorian puts a rather disappointing number of wounds on the surviving Survivor. I score for Interference and Jamie scores Punish The Weak. Turn 3: Sammy Jinxes Molly to stop her from declaring triggers (uh oh!) and makes her scary to her friends again. In return, Molly kills Sammy. How do you like that de-buff, Sammy? She then chain activates a Kentauroi that totally fails to even hit Trixibelle. Mah kills the Necrotic Machine and the Rogue Necromancy shows the Valedictorian how things are done by eating the Survivor. Trixibelle kills another Kentauroi and Slows the one while incidentally putting about 20 Poison on it. I score for the strategy and we both score Punish The Weak. Turn 4: Trixibelle kills a Kentauroi and Molly kills her. Mah makes it to my board edge and starts dropping scheme markers. It’s clear that the game is done now so we just agree that we can drop the required number of scheme markers for Covert Breakthrough. Resurrectionists win 10 – 6 (full score for me, 3 for Covert Breakthrough and 3 for Punish The Weak for Jamie). Jamie is a really fun opponent and I had a great time playing with him. I think that he got too bogged down in the scrum caused by Molly and her summons to have a chance of scoring for Interference; of course, that was my intention but he didn’t seem to have any plan to break out of it. I was quite surprised by his choice of victim for Mah’s first turn attack; she could easily have killed the Necrotic Machine or Guild Autopsy just to control my activation count whereas she was highly unlikely to do anything substantial to Yin. From my side the game went quite nicely to plan. The Valedictorian was a bit disappointing in that the only time I threw her into combat the cards didn’t fall my way. However, she was on the far side of the board from most of the action so perhaps I’d have been better loading the centre during deployment rather than spreading out (I had to deploy first so I couldn’t react to Jamie’s positioning). Once the scores are in I have done well enough to take second place, somewhat behind the mighty Lewis on VP difference. I was very glad to get out to this event and I feel like I’m perhaps out of my ‘Malifaux funk’ now. Thanks to Kai for his hard work running the event, and to Michael, Ross and Jamie for three very fun games of Malifaux. I will be back! This is Datsue Ba, another part of my Malifaux Resurrectionist crews. Like many I’ve painted recently, Datsue Ba has the Spirit keyword giving her some nice synergy with both Molly (when taking the Forgotten Path upgrade) and Kirai. I’ve mainly used her as a bully of opposing scheme runners as she can get additional free attacks on a trigger to her melee option and more amusingly can summon ghosts from those she kills with her spells. Picking the right target at the right time can give a very useful attrition swing as the other crew loses a member while I gain one. Datsue Ba has few wounds but is often inefficient to attack considering that she is both Terrifying and Incorporeal; she certainly doesn’t want to be in the thick of the action but seems to work best floating on the edges of an engagement picking off the weak stragglers and turning them into my own Onryo and Gaki. I chose to make Datsue Ba’s skin look ghostly rather than rotting and in retrospect I should have chosen a different colour for her dress as there is too much green in the end. I realised after I finished the paintwork that she looks like Yamaziko has died and become a vengeful spirit. Overall not the most inspiring miniature I’ve worked on but I’m really glad to get her out of the queue and into the crew (not that I have any qualms about playing with unpainted miniatures). I think that Datsue Ba is based on some actual Japanese folklore, but I’ve never yet had a satisfactory explanation of why she has an octopus on her lantern. Next on the painting table: Witch Coven of Garlghast and the Egregore. Here’s the Graveyard Spirit, a totem available to all Resurrectionist Masters in Malifaux. It pretty much does one thing only, which is to provide armour to friendly models in base contact. Notwithstanding the huge number of things in the game that totally ignore armour, this is quite good at making your crew last longer. Surprisingly, no-one ever seems to bother attacking the Graveyard Spirit directly. It works quite nicely as a totem for spirit Molly since she gives it Black Blood and conveniently won’t bleed all over it. In a pinch, you can therefore use the Graveyard Spirit as a sort of Black Blood bomb by moving it to an annoying position then hurting it yourself in order to damage nearby enemies. I didn’t do anything clever with the painting. The ghost part is white with a faint green wash and the gravestone is just boring grey. An easy but effective paint job for a cheap model; I’m rather pleased with the result. [Edit] WordPress also informed me that today is the 8th anniversary of my first post. Eight years is not a bad age for a blog about a niche part of a niche hobby, and I think that I’ve managed to post at least once per month on some hobby topic or another since then. These are a pair of Goryo for my Malifaux Resurrectionists. I was partly drawn to the idea of playing Resurrectionists because of how cool these miniatures are, and the fact that I can play them with Molly to give them Black Blood really sealed the decision. They’re remarkably fast, have a good (0) action that never does what I need but always draws a card from the other player and can make opponents Slow with a trigger on their sword attacks. Perhaps more importantly for Molly, they are summonable and come on the largest base size. Since Molly’s summoning is affected by how many enemy models are it on arrival, this is really useful and is frequently the reason that I would summon them rather than Shikome at the same cost. Once summoned, I don’t really do anything clever with the Goryo, just stand next to something and stab it repeatedly, and hope to splash Black Blood around if anyone dares to attack back. Assembling the Goryo was extremely frustrating as the main body doesn’t line up very well with all the attached ghosts, and they’re all twisted round each other (and the sword arms) to make the tiny contact points tricky to reach. Once complete, the painting was similarly awkward as I had to work around the ghosts to get to the kimono underneath and I spent a lot of time re-painting sections that my clumsy hands had marked. Once I got to the end of the process it felt all worthwhile and I remembered why I’d bought the miniatures in the first place. This weekend was the Malifaux Scottish GT for 2018 and Gareth and I traveled over to Common Ground Games in Stirling to take part. I hadn’t really been in love with Malifaux lately (the last event was back in March, four months ago) and neither of us had played since then. Indeed, I was considering pulling out entirely but we decided to attend and make the most of seeing the many friends we’ve met through Malifaux. Gareth and I put in a couple of practice games to remind ourselves how to play and I realised that I’d forgotten too much to attempt multiple crews. So I chose to play single master all weekend with Molly, with only minor crew variations, in order to give myself a chance to remember at least my own models’ abilities even if not those of everyone else. This is my basic Molly crew. The upgrades are easy picks; Forgotten Path is needed to make her Spirit Molly in the first place, Take Back The Night gives some very nice card draw (when I remember it) and Wronged Spirits is free and is occasionally relevant whether I start with or summon Onryo. Izamu and Datsue Ba give a bit of damage, and some nice utility and summoning in the latter case. Anna also does quite reliable damage with her ranged attack, has Rush of Magic for some card-cycling and her aura of no pushing / placing is critical in some games. Indeed, it would even more useful if I remembered it more often. The Belle and Doxy are there for movement utility and (along with the Onryo) scheme running, incidental damage etc. Finally, the Graveyard Spirit can make Molly a bit more survivable when she’s in harm’s way (which is pretty much all the time) and, being a Spirit, can in a pinch act as a Black Blood bomb. The general idea is to ram Molly and Izamu down the other crew’s throat as rapidly as possible in order to gum them up working through my summons and taking incidental damage from Black Blood through the process. The rest of the crew can contribute or get on with the business of scoring as needed. Considering how far shy I felt of ‘fighting weight’ I was quite glad to get picked against Colin for the first round. Not only because he’s a really nice, fun guy to play against but also I will admit that he’s far below me in terms of experience and therefore I could have a fairly straightforward game to warm-up. I mean no disrespect to Colin in this, and if he reads it I think that he’ll probably agree with the assessment. I had absolutely no idea what Colin would pick since he’d choose anyway based on his own amusement rather than for any particular schemes. I took Recover Evidence since it matches what I want to do with this crew (i.e. engage turn 1, drop Evidence Markers turn 2, blend entire crew turns 2 to 4, collect Evidence turn 5) and Vendetta since Belles make it a pretty straightforward 2 VPs. For those paying attention to the photos, initially Francisco Ortega was deployed on my left but Colin realised that he’d made a mistake with the crew builder application and replaced him with a second Death Marshall. In addition, the Trapper is a proxy for the Pathfinder, and some random model that I don’t recognise is representing the Pistolero. Turn 1: The Doxy pushes Molly and Datsue Ba makes Izamu walk forward. In general the first turn movement is a bit cagey as Colin doesn’t want to give me easy summons and I don’t want Perdita to vapourise my crew. The Pathfinder summons a Trap and the Belle Lures in the Pistolero to score me a VP for Vendetta. Eventually Molly gets close enough to the Peacekeeper and Death Marshal on the left and summons in a Hanged and a Goryo, then makes Izamu advance again. The Goryo does some sterling work stabbing wounds past the Peacekeeper’s armour until Perdita Obeys it to get rid of my ghost. Turn 2: Molly hurts the Pistolero mainly to get the push trigger on Revelation and move to a better summoning location. She then summons a replacement Goryo which kills the Peacekeeper and chain activates Izamu to drop the left Death Marshal. The Pistolero helpfully fails a horror duel on the Hanged which itself fails to get Whispers From Beyond on Perdita (I do draw the Red Joker on defense though). Anna eventually kills the Pistolero; it was more convenient than having the Belle do it. Perdita kills the new Goryo and the Doxy pushes Izamu into a big clump of Colin’s models. Datsue Ba get the Effigy down to its Hard To Kill wound and the Onryo misses the Death Marshal a couple of times. I score Ours. Turn 3: We both declare Recover Evidence. The Death Marshal hurts Izamu and gets him down to a single wound. In return, Izamu kills the Death Marshal, the Effigy and the Enslaved Nephilim, dying to Black Blood in the end since he was too far from Molly; it was a warrior’s death (but not a Warrior’s Death, of course). Perdita kills the Hanged and Anna kills one of the Guild Guard. The Belle and Onryo pick up Evidence since its now just lying around unattended after Izamu’s killing spree. Molly puts Slow on Perdita. I score for Ours again. Turn 4: Perdita shoots Molly, but she’s in cover and protected by the Graveyard Spirit so it’s not very effective as Perdita can’t ignore both cover and Armour. Datsue Ba kills the second Guild Guard and collects my last piece of Evidence. The Pathfinder continues his long-running duel with Anna and she returns fire this time. Molly sticks Whispered Secret on Perdita but can’t actually wound her, and finally the Onryo fails to kill the Pathfinder. I score for the strategy. Turn 5: Perdita fires a few more bullets ineffectually into Molly, and the Onryo kills the Pathfinder. I score Ours for the last time. Resurrectionists win 9 – 0 (4 for Ours, 3 for Recover Evidence and 2 for Vendetta for me; nothing for Colin). It looks like I forgot to take one last picture. That was a nice game to get us started. It was a bit of a mismatch in terms of skill, but Colin is a really great guy and I had a lot of fun chatting with him while we played. Not much to learn from my side about the game; I probably could have scored the last point for Vendetta with a bit of effort but I think it was not very important. For game 2 I got paired with Ross. He’s a very strong player, having taken top Gremlin in this event in 2017. He’s much more in practice than me so I knew that this would be a really hard test. With this slight more killy game I dropped Datsue Ba and the Onryo (both pretty easy to kill) and replaced them with Hannah and two copies of Unnerving Aura. I love the combination of Hannah, Anna and Molly. Seeing 8 cards a turn and holding 7 of them is amazing for a summoner and Hannah copying Anna’s ranged attack is beautiful. Hannah is also conveniently immune to Black Blood, and her 3″ melee range works nicely with Unnerving Aura. Ross picked Zipp, a master I hate to see across the board as his main attack ignores pretty much every defensive tech in the entire game and is very hard to pin down. I took Undercover Entourage on Molly thinking that I would be sending her forward anyway, and Take One For The Team on the Doxy since they usually end up in harm’s way in the late game and are very attractive targets for models with weak damage of three like Burt. I seem to have forgotten to take a photo at deployment. Turn 1: I look at my hand in horror; even after stoning I have a 10 and then the rest is weak cards. So much for Hannah and Anna! The Student makes Zipp Fast and the Doxy pushes Molly. Ross wastes activations with the Bayou Gremlins while I move up cautiously. In the end I commit Molly to summon a Drowned engaged with a big chunk of Ross’s crew and it drops the Lightning Bug. Burt hurts it a little and Zipp finishes it easily with Up We Go, then does the same to Molly three times. Fortunately I can use all the rubbish in my hand to reduce the damage… oh wait, it’s Zipp so I can’t. Zipp then turns into a Bayou Gremlin which Incites the Graveyard Spirit. Turn 2: My hand is even worse than last time, this might hurt. The Student makes Zipp Fast again and the Graveyard Spirit charges a Bayou Gremlin (sometime you can get lucky with it). Zipp bounces Molly around like a basketball (scoring a point for Eliminate the Leadership in the process) and then traps her in an alleyway behind his smoke markers and turns into a Bayou Gremlin. Hannah copies Anna’s ranged attack to hurt Raphaelle and then walks to hit and engage the Swine-Cursed. Raphaelle double Focuses but misses Hannah anyway. The Doxy pushes Izamu up and kills a Bayou Gremlin, and Izamu polishes off the Swine-Cursed. Molly spends all her attacks and fails to even wound the nearby Bayou Gremlin, and Anna likewise misses one. Burt kills the Doxy, evening us up on the strategy but scoring me 2VP for Take One For The Team. Turn 3: Zipp finishes Molly to pick up the rest of the points for Eliminate the Leadership, hides himself with clouds and turns into a Bayou Gremlin. Izamu kills Burt and Anna nearly gets her Bayou Gremlin. Hannah gets Raphaelle and the rest of the Gremlins take pot-shots at Anna to limited effect. I score for Public Executions. Turn 4: Anna Black Jokers damage on her Bayou Gremlin and it plinks away at her in return. In the end I have to commit Izamu to kill the annoying little chap so that I could have a chance to score for the strategy. Zipp shoots Anna and Hannah copies her sister to shoot back. I score for the strategy. Turn 5: Izamu kills another Bayou Gremlin and Anna shoots Zipp. Zipp shoots her back (to push her in case I had Undercover Entourage on her) and move to confirm Take Prisoner on the Graveyard Spirit. Resurrectionists lose 5 – 6 (3 for Public Executions and 2 for Take One For The Team for me; 3 for Eliminate the Leadership and 3 for Take Prisoner for Ross). I really enjoyed that game! Of course, it helps that Ross is a real gentleman and a pleasure to play, but it was very close all the time. I actually was convinced that he would have taken Undercover Entourage on Zipp so when he revealed Take Prisoner on the Graveyard Spirit I was impressed. My biggest single mistake was taking Undercover Entourage on Molly. With Eliminate the Leadership in the scheme pool Ross had a big incentive to kill her, and with Zipp he had all the tools needed to do so easily. I gave away Take Prisoner too easily, it shows that I’m out of practice as I never considered it at all. None of this takes away from Ross who clearly had a plan of what to do, and cleanly delivered it; well done to him. Game 3 sees me up against David Hamilton. We’ve played Malifaux many times and he’s one of the people I consider to be closest to me in terms of ability; neither of us have an advantage. Another game where survival is key so I stuck with the same build as last time. Molly really loves close deployment as she can throw her summoned models into the other crew right from the get go. I was really worried about David’s beautiful (but apparently coincidental) counter-picking of my crew. I’m looking to utilise Armour and Incorporeal to keep my pieces around for longer than usual, and his entire crew ignores Incorporeal and most of them ignore armour too. I realised that this game would be decided in the early engagement and hoped that my summoning would be instrumental in surviving the attrition. Therefore I picked schemes that I could score at the end, i.e. hopefully after I had already wiped the Gremlins from the board. I could also summon Drowned to get markers out where I need them most. Again, I seem to have forgotten to take a picture of the start. Turn 1: In a surprise move, Wong makes Burt Magical. I win initiative but for some reason don’t take my chance to go on the offensive. Wong comes up and zaps Izamu. I cheat high enough to get a negative flip but he gets double moderate anyway, splashing damage over Molly, the Graveyard Spirit and the Doxy. He does it again, and the same thing happens (killing the Graveyard Spirit this time). I’m quite frustrated by this and I actually say to David that I think that this might be enough to win him the game eventually (because we’re so well matched, a bit of good luck at a critical point can be enough to decide the eventual result). Realising my mistake, I go for full aggression. Molly gets moved up by the Doxy who also attacks Wong to make hims Squeal back into his lines. The left Swine-Cursed takes the bait and kills the Doxy. Molly uses the push trigger on Revelation (against the Swine Cursed) to move further up, then summons a Hanged and a Goryo. The Hanged kills the central Lightning Bug, but sadly everyone passes the resulting Horror duel. The other Swine-Cursed pushes Burt forward and Hannah charges Burt to engage both. Sparkly Lights lets Magical things ignore disengaging strikes too so Burt strolls over and nearly drops Izamu. Izamu gets him down to Hard To Kill and the Belle finishes Burt. The Lightning Bug kills my Goryo, Sammy kills my Hanged and Anna kills the left Swine-Cursed. What a turn! Fortunately some of my losses are (replaceable) summons so I’m feeling better about the attrition situation. Turn 2: Molly summons another Hanged and Goryo. Izamu chain activates and he hurts Wong but Black Jokers the killing damage flip against the Lightning Bug. The Swine-Cursed attacks Hannah and my new Goryo hurts the right Lightning Bug and gets killed in return. Anna kills the second Swine-Cursed and gets Sammy down to a single wound. The Lightning Bug that Izamu couldn’t kill shows him how it is done. Hannah misses attacks at Sammy and Wong misses Hannah. The Hanged moves over to make sure I score for Guard the Stash. Turn 3: Molly summons another Hanged and plinks a few more wound off Wong. She makes the new Hanged kill the Lightning Bug and chain activates Hannah who gently tickles the Hanged to kill Sammy with Black Blood. The Lightning Bug kills the Belle and the Hanged gets Wong down to a single wound. We’re not quite done with the turn but David has seen enough (he has only 2 wounds left on the table) and calls it. Resurrectionists win 10 – 0 (full score to me; nothing for David). That didn’t go quite as I expected. I genuinely thought that the game was effectively decided at the very start, but after that I had good luck and great hands, and David didn’t have good cards when he needed them. In addition, a ‘knock down, drag out’ brawl in the centre suits me very well and is good for Molly if she can survive the initial impact. I was able to keep Wong engaged for most of the game which really limited what he could do. Crucially, David had to spend a lot of resources dealing with my summons while every model of his that I killed reduced his ability to keep fighting. The evening meal was a really good burger and chips followed by some lovely beer. One thing I like about these two day events is that there is an opportunity for socialising in the middle evening. Ultimately, a lot of the chat is about Malifaux (obviously since that is what brings us together) but it still feels like we can get to know each other better than when we’re only facing across the table. Game 4 was against Callum. We’ve played quite a few games over the last couple of years but none for a while, and it’s always been a fun experience. Back to the classic crew for this one as I needed the extra activations and mostly didn’t care if I lost cheap pieces as long as I could do it on my terms to some extent. When I saw Callum’s crew I almost got PTSD flashbacks to the horrendous mauling delivered to me by the mighty Josh Leak in game 6 of the last Scottish GT. Fortunately, I know better how to deal with the McMourning crew now, and anyway my game plan this time is to rush him rather than hang back. At some point I’d have to deal with the Belles, Canine Remains and probably Flesh Constructs so I took Punish the Weak, and decided to double down on the killing game by making Dig Their Graves my second scheme. Turn 1: The Canine Remains digs up a corpse marker, and to my great surprise Callum cheats in the Red Joker to make it work. Sebastian turns it into another Canine Remains. McMourning uses Injection to push a Belle. Molly gets pushed forward by the Doxy, double walks and drops a Hanged into a nice clump of models. It then successfully sticks Whispers From Beyond on McMourning, making him a much easier proposition to deal with. The Belles Lure Izamu around and eventually Archie puts a little damage into him. Turn 2: McMourning does Rancid Transplants and Expunges my Hanged into a Flesh Construct (scoring him for Punish The Weak). A Belle chain activates to pull him slightly back from the fray. Molly uses the push trigger on Revelation against a Belle the drops a replacement Hanged and a Goryo into the scrum. She then chain activates Izamu who smacks a nice number of wounds out of Archie. Anna hurts the right Belle, paralysing her and drawing cards to avoid Sebastian and the Canine Remains getting the same treatment. The Chihuahua farts on Molly and is killed off by the Doxy. Archie Leaps over Izamu and smashes Molly with a frustrating double severe damage on a negative flip; sadly I don’t have enough cards to drop for Molly’s trigger. Datsue Ba turns a Belle into an Onryo to score my Punish The Weak and it hits McMourning. Callum reveals Set Up on Izamu for 3 VP. Turn 3: Molly summons another Hanged and puts Whispered Secret on Archie. She makes the Goryo attack McMourning (on his last two wounds at this point) then chain activates to continue attacking but a combination of Black and Red Jokers and a heroic flip from Callum means that the doctor survives untouched. McMourning Rancid Transplants the Hanged into a Flesh construct, doing enough incidental damage to also finish off Izamu and also scoring for Punish The Weak. The Onryo on the right completes its long walk to the first Symbol and removes it, taking advantage of Incorporeal to saunter through the building on the way. Sebastian hurts Datsue Ba and applies Poison so that the nearby Canine Remains can also sharge her. The Doxy kills Archie and Takes the Lead to move Sebastian, but unfortunately not enough to get Datsue Ba out of his Induction aura. Datsue Ba hurts the Canine remains and both she and an Onryo die to Poison at the end of the turn. Somewhere in here Anna finishes off a Belle for my own Punish the Weak. Turn 4: Molly drops the last Belle to score for Punish The Weak then chain activates the Hanged who kills the first Flesh Construct. The trigger Paralyses the second Flesh Construct and Sebastian who helpfully flips the Black Joker; this also scores Dig Their Graves for me. The Doxy kills the Canine Remains in the centre then pushes Anna back toward the other one (which has been making a long run to my Symbols) where she kills it. My Belle collects the left-most Symbol. Turn 5: The Flesh Construct hurts the Doxy. Molly takes advantage of an unfortunate Black Joker from Sebastian to Paralyse him with Revelation. The Onryo takes the final Symbol. We spend a while trying to work out if I can possibly get a scheme marker near enough to Sebastian to score Dig Their Graves and eventually conclude that I can’t. My Resurrectionists win 8 – 5 (4 for Symbols of Authority, 3 for Punish The Weak and 1 for Dig Their Graves for me; 3 for Set Up and 2 for Punish The Weak for Callum). A very nice game with Callum. Luck certainly played its part here, in Callum’s favour keeping McMourning alive for an activation of turn 3 and then in my favour with Sebastian getting two important Black Jokers. I didn’t really have much of a game plan to score Dig Their Graves; in retrospect I probably should have summoned a Drowned at some point. On the other hand, Callum’s plan to score the Strategy seemed to revolve around a single Canine Remains so perhaps I was never likely to lose that part. I think his crew was probably better suited to staying still and bringing its victims in piecemeal rather than either being rushed or needing to go across the board (or both as in the case here). This was my first games of the event against a new opponent, and who better than the famous George. I was really glad to be able to get a game in as I’ve heard much about him and the rest of the Flippin’ Wyrd team. For this strategy I dropped the Onryo for a pair of Night Terrors. They’re quite inefficient to kill considering their cost, and as Minions they score quite nicely for Interference. George obviously decided that an ‘all in’ aggressive approach was also indicated, and this suited me quite nicely. Covert Breakthrough felt like a good idea as I could score it at the end once the dust settled. I then picked Undercover Entourage on Anna, partly because I’d learned my lesson from game 2, and partly because no-one ever bothers to attack her. It looks like I once again forgot a picture of deployment, which is a shame since the board looked a lot different by the time turn 1 ended. Turn 1: I decide that this game will best be played with full-on aggression so Molly walks up, drops a Hanged in Langston’s face and sticks Whispered Secret on him. She then makes Izamu walk forward and chain activates the Hanged which Paralyses Langston. Myranda charges Molly and turns into a Cerberus, a trick I feel haven’t seen in a long time considering how popular it once was. The Doxy pushes Molly back into Anna’s Gravity Well so that the Cerberus can’t Leap after her. The Medical Automaton removes both conditions from Langston. Oh dear. I hadn’t been aware that was possible (I’ve never seen it before) and I think I might have possibly taken a different approach if I’d known that was possible. Anna shoots the Cerberus to remove the Three-Headed bonus and summons an incidental Seishin in the process. Langston copies one of Sandeep’s abilities in order to let Sandeep do something himself; needless to say he takes the opportunity to kill the Hanged. Langston comes steaming into Molly and kills her. I throw the Seishin and Graveyard Spirit into the Cerberus and knock off a couple more wounds. Joss fires himself across the board into the Belle. Datsue Ba hurts the Cerberus but sadly can’t finish it off (which would have got me a Gaki) so Izamu kills it and charges Langston. Sandeep hurts the left Night Terror. Finally the Belle Slows Langston. Wow, what a turn! Turn 2: Izamu kills Lansgton and I breathe a small sigh of relief. Sandeep finishes the Night Terror to score Punish The Weak, then summons a Wind Gamin. The Doxy applies Confused Feelings to Joss and pokes him a bit. Raptors team up to kill the other Night Terror. Anna pushes Joss so I can get a second Pounce on him from the Doxy and knocks a few more wounds off. Datsue Ba gets Joss down to a single wound but can’t get the triggered Weigh Sins attack to land due to the negative flips from Bleeding Edge Tech (in retrospect I’m pretty sure I had a Soulstone to counter this and the card to make the target number; if so it was pretty big error on my side). Joss Reactivates and kills the Doxy. No-one scores for the strategy. Turn 3: Anna kills Joss. The Gamin on the left puts down a scheme marker. Datsue Ba kills the Medical Automaton, then Sandeep runs far away from Izamu. Izamu is relegated to scheme running duties. I throw the Graveyard Spirit into Sandeep and the Raptor unbury to deny us both the strategy. I didn’t have it in my notes but presumably Sandeep killed something else (probably the Seishin) to score Punish The Weak. Turn 4: Datsue Ba Focuses and casts Weigh Sins on the Raptor in front of her. On a straight flip she Black Jokers the damage, not only leaving the annoying bird around for another turn (to certainly deny me strategy points) but also stopping me from summoning another minion of my own. Sandeep summons another Gamin and kills the Graveyard Spirit for Punish The Weak. George scores for Interference. Turn 5: Datsue Ba repeats the process, this time getting an Onryo out of the Raptor. Anna saunters into the Arcanist deployment zone. We both score for the strategy. Resurrectionists lose 7 – 8 (1 for Interference, 3 for Covert Breakthrough and 3 for Undercover Entourage for me; 2 for Interference, 3 for Covert Breakthrough and 3 for Punish The Weak for George). Wow, what a game! I really enjoyed the whole thing, starting out with a brawl and ending with us both scrabbling round to deny the other points. It was an absolute joy to play against George and I hope that I’ll get to do so again. I was a bit frustrated by the Black Joker intervening on Datsue Ba attacking the Raptor on turn 4 as this literally cost me a point and therefore a draw. Still, I suppose that what the Jokers are in the game for. I had a bit of a rude shock when I found out that the Medical Automaton could remove conditions as I thought I’d safely locked down Langston for a turn to keep him out of my hair. Still, that sort of thing was probably to be expected at least once in the course of the event since I’ve not been getting exposed so much to wave 5 stuff. I possibly missed an opportunity to kill Joss in turn 2 rather than giving him a free Reactivate but I didn’t note it down so perhaps that is just wishful thinking. Anyway, George played very well and was a real gentleman, so he deserved the win. For the last game I’m happy to be up against Lewis. He’s an extremely good player and a good friend, and it’s quite nice to be able to round out the event with a friendly match-up (we’re both 3 – 2 at this point so nothing meaningful is riding on the result). I’m not sure that this was the best iteration of my crew to play Supply Wagons; possibly using Hannah as a large base to push the Wagon forward at the start would be better. Anyway, I decided that I could afford to have the Belle, Doxy, Onryo and maybe Datsue Ba spend a few AP moving it around, then use them as a second wave once Molly, Izamu and the summons were despatched. Recover Evidence fits my ‘kill them all and score at the end’ plan, but I didn’t like any of the others at all. In the end I took Hold Up Their Forces on the grounds that I would probably end up engaging something and could possibly find some way to kill off any spare summons that would stop me from scoring it. Lewis’s crew was more or less what I expected, but I did like the use of the Hunter to push the Wagon. Turn 1: The Sanctioned Spellcaster casts Singularity and teh Queller puts a Suppression Marker in my face. Nellie makes the Hunter, Executioner and Phiona Fast. The Hunter fires Lewis’s Wagon way up the board, meanwhile the Doxy, Belle, and Onryo heave away at mine for minimal effect (though the Doxy pushes Molly forward of course). In the end I leave the Wagon sitting on top of the Suppression marker to make my life a bit simpler. Nelly can wait me out by passing activations so I’ll have to make the first move. Molly walks twice and drops a Goryo into the crowd loitering almost in the Guild deployment zone. She makes it hit the Executioner, then chain activates to do the same again which rather nicely gets the Slow trigger on both shots. Phiona charges through a gap and starts smacking Molly. Turn 2: Molly summons a Hanged and another Goryo more or less into the same mosh pit of ghosts and Guildies. She chain activates Izamu who lays into Phiona and gets her down to her Hard To Kill wound and bleeds a load of Soulstones off her. The Queller gives the Executioner enchanted weapons. I don’t like the sound of that so the Goryo kills the Executioner. Nellie makes Phiona Fast so Datsue Ba kills her with Weigh Sins and turns her into a Gaki. The Sanctioned Spellcaster commits suicide. We both score for the strategy and Lewis scores for Inescapable Trap. In the first of many errors that we only noticed later, he forgets to declare Hold Up Their Forces. Turn 3: I announce Recover Evidence. The Press charges up Nellie and the Hanged moves to engage both it and the Investigator. Izamu kills the Queller and Nellie Slows the Onryo and pushes it away. The Gaki and a Goryo collect Evidence markers and various things bounce off Nellie, getting her eventually down to a single wound. We both score Supply Wagons and Hold Up Their Forces, Lewis also scores Inescapable Trap. Nellie has about 100 Evidence at this point so she heals and does some other shenanigans. Turn 4: The Hunter attacks Anna. I have a clever plan to kill Nellie by attacking my Goryo with Datsue Ba and splashing her with Black Blood. Unfortunately, only after when I’m flipping the damage on my first attack do I remember that the Goryo is not close enough to Molly to have Black Blood. Oh dear, it seems that the weekend has taken more than I thought! Eventually Nellie does die to the Goryo, but not before she’s pushed Datsue Ba over to engage the Press and Investigator and therefore deny me my scheme. The other Goryo makes a run for Lewis’s wagon, getting a third walk thanks to Molly’s (0) action. The Doxy pushes the Hunter away from Anna and picks up the last piece of Evidence. Anna kills Datsue Ba, but she drops a corpse marker and so the Investigator pushes away from the Hanged. Looking back, he was close enough to Anna that there were no legal pushes and should have stayed where he was, but I forgot about it. We both score for the strategy. The Goryo pushes Lewis’s Wagon back into his side of the board. We do a lot of movement shenanigans to avoid giving up points for the schemes while scoring our own, but the upshot is that Lewis gets another point for Hold Up Their Forces while denying mine (again, I think that this might have involved a push which Anna would have stopped if I had remembered it). I score for Supply Wagons though. Resurrectionists win 8 – 7 (4 for Supply Wagons, 3 for Recover Evidence and 1 for Hold Up Their Forces for me; 3 for Supply Wagons, 2 for Inescapable Trap and 2 for Hold Up Their Forces for Lewis). As always, a super game against Lewis and a highly entertaining way to finish the event. In the end I think that we were both a bit frustrated by our play errors, but we were both a bit burned out by this point so I imagine that they probably evened out. I’m not going to assess my own errors in this section, partly because I mentioned the biggest ones in the report itself and partly because there were so many of them that it would boil down to ‘don’t play badly’. I played a few games next to Ali Ferguson, though never actually against him this time out. We were both playing mono-Molly but he was doing the Horror version so we decided to make this event the definitive conversation on whether Spirit or Horror Molly was superior. We both finished on the same record (won 4, lost 2) but I had a slightly better points difference. I was also amused by the fact that our Mollys were wearing the same dress completely at random (as far as I know neither of us have ever seen the other’s painted Molly). Talk about a fashion faux-pas. Once all the results were in, we were all asked to go outside; I had assumed it was for a group photo of us all. I assumed wrong. The awesomeness of Malifaux in general, Scottish Malifaux specifically and the Scottish GT in particular knows no bounds. Prizes were given out from the back of a unicorn, and I can hardly express how entertaining I found this. Once all the scores are in I am delighted (and a bit surprised) to come in sixth place. I had an excellent time and I was certainly glad that I had not chosen to pull out. Thanks to Colin, Ross, David, Callum, George and Lewis for six wonderful games of Malifaux, and of course to Kai and his team of helpers for putting on a really special event. Here are Shieldbearers for my Malifaux Resurrectionist crews. They’re an interesting option, starting out with the Living keyword, then healing all wounds and gaining the Spirit keyword once they die (only once of course). They’re thematically linked with Reva, and support her well enough by dropping a corpse marker when then ‘die’ the first time, but I like them better with Kirai. For a start, they start out Living and so can trigger Malevolence, then become Spirits and can use the numerous abilities on Kirai that are relevant to that keyword. They’re great for Kirai’s summoning since they have a lot of wounds for their cost and have I-can’t-believe-it’s-not-Hard-to-Kill in the middle of them. Since they gain Fast when a nearby model uses a Soulstone they’re also good for hanging around a summoner. Their actual abilities are quite modest after that lot, but they can fight, survive and scheme well enough that I like putting them on the table. I very much enjoyed working on the Shieldbearers. By the standards of Malifaux models they’re incredibly easy to put together and I like the poses. Even the ludicrous Final Fantasy style giant weapons seem to work for them. I went with a naturalistic colour scheme for these since they’re just regular humans among the ghosts, zombies and wizards (or combinations of all three) that comprise the majority of the Resurrectionist faction. The one with the sheathed sword’s head reminded me passingly of my Grandma so I painted the Shieldbearer to have grey hair in her honour. Next on the painting table: Goryo. Here’s Anna Lovelace, sister of Hannah (who is never given a surname that I’ve seen). She’s part of the Resurrectionist faction for Malifaux, but as a Mercenary she can show up with anyone. I really love to use Anna in my crews; she provides three main benefits. Firstly, she has Rush of Magic. It’s not a big deal but in a game of cards having a bit of extra deck cycling is pretty nice. Secondly, she has a really good ranged attack; it has minimum damage of 3 and doesn’t randomise into combat. Considering that my normal play in Molly crews (where Anna shows up most for me) is to ram my entire crew down the other crew’s throat as fast as possible, not randomising into melee is huge. Finally, she has abilities that stop enemy models pushing or placing near her. This might seem small but the number of crews now with little pushes to get in or out of combat or something is quite large and making them play around this can lead to interesting effects. As Anna is thematically a Freikorps model, I painted her according to my others. 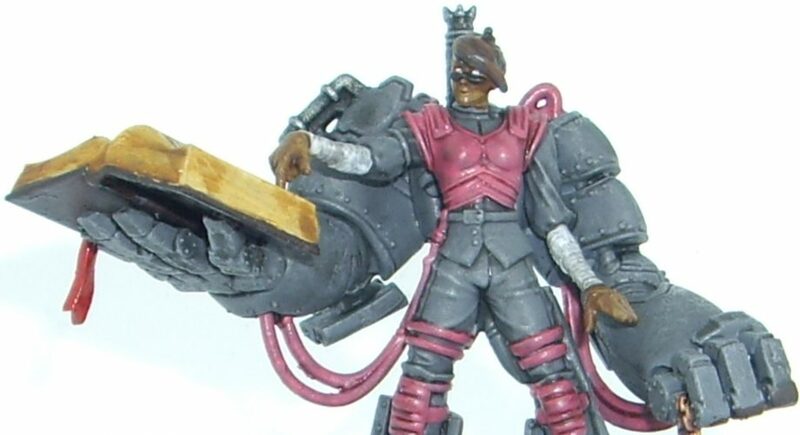 So primarily grey armour (clockwork dress in Anna’s case, which sounds rather uncomfortable) with pink for contrast. She was a quick, easy paint job and I think she looks quite fine. This is the Carrion Emissary, a nice centrepiece model for my Malifaux Resurrectionist crews. The Carrion Emissary brings some rather useful abilities to Resurrectionist crews, having a really nice (short) ranged attack and the option to put down blocking terrain pieces called Shards of Kythera. On crowded boards this can be crippling to some crews all on its own. Not only that, but when the Shards disappear they can have a Mindless Zombie appear. This is, of course, very useful for anyone who wants corpse markers handy for either summoning (Nicodem) or attacking (Reva). One of the most interesting things about the Carrion Emissary is that it can choose from one of eight free upgrades; a generic one and a specific one for each master. I’ve prefered the generic one in most cases as there is often a frustrating anti-synergy to go with the benefits of the master-specific upgrades (and I should point out that most people seem to prefer to pay for My Little Helper anyway so that a second set of Shards can be employed). I painted up the Emissary sort of like a big crow, but realised that a black beak didn’t look right so it got a light brown beak instead. It was really nice to play with a large model like this and I spent a bit longer highlighting the wings than normal. The clothes ended up looking a bit like it’s cosplaying as Obi-Wan Kenobi but this wasn’t intentional; anyway I like the contrast with the dark feathers. There is supposed to be some kind of skull doo-dah in the right hand but it kept falling off so in the end I just gave up on trying to keep it attached. I would like to dedicate this post to ‘Jewel-y‘ (i.e. Jewel of July) as proposed by the excellent Azazel. I always love their hobby blogging challenges even when I don’t take part. These unhappy looking chaps are Onryo, more Spirits to go in my Malifaux Resurrectionist crews. They’re cheap minions who don’t really do too much exciting except pass on fairly minor conditions when hurt. Still, they pack a surprising punch when needed and more importantly are quite mobile thanks to Incorporeal. I mainly use them as Black Blood bombs with Molly if I need to stack damage onto high defense enemies, or just send them off scheme running. Onryo are cheap enough that I don’t mind too much if they get killed (which will happen if anything actually seriously has a go at them since their defensive stats are terrible). I hadn’t actually intended to paint the Onryo to match Molly’s colour scheme but now that it has happened I think it looks quite nice. As befits their status I kept a limited palette without any needless flourish. I’ve seen Onryo out there with amazing freehand work on the kimonos but that would be way beyond me even for a master, never mind doing it on a minion. Next on the painting table: Harlequin Troupe Master.